Ladakh is the part of Jammu and Kashmir and is a resplendent attraction for its heightened rugged charm and natural appeal. A visit to Ladakh is must if one wants to experience the variation of topography in Kashmir. This week long tour trip to Leh – Ladakh is filled with surprises of all kinds where adventure and spirituality rests beautifully in a single destination. Experience nature’s pristine element with a discovery of mighty mountains, wonderful landscapes and serene Buddhist monasteries. Explore all this and much more during Ladakh Great Deal Package. Day 01: Delhi to Leh Arrival at Leh airport and transferred to the Hotel. Complete day for Acclimatization. Later evening visit to Leh Market, Leh Palace and Shanti Stupa. Overnight in Leh. Day 02: Leh - Lamayuru – Ule. After breakfast, drive to Lamayuru enroute visit Likir Monastery, Magnetic Hill and Gurudwara Pathar Sahib. Lunch enroute, post lunch drive to visit the mesmerizing Moon landscapes and Lamayuru monastery Overnight Ule. Day 03: Ule - Leh. After the breakfast, drive to Leh enroute visit Alchi monastery and Hall of Fame. Arrive at Leh by afternoon. Overnight Leh. Day 04: Leh - Nubra Valley. 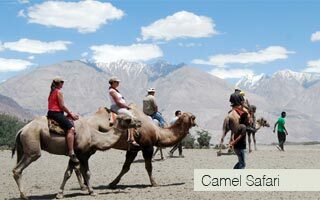 After the breakfast, drive to Nubra Valley via Khardungla (Highest Motorable road in the World, 18,380 ft) post lunch; enjoy the camel safari at Sand Dunes between Deskit & Hundur Village. Overnight Nubra Valley. Day 05: Nubra Valley - Leh. After the breakfast, visit Deskit Monastery (Big Buddha), where you can have a magnificent view of Nubra Valley and drive back to Leh by same Route, crossing Khardungla Pass. Overnight in Leh. Day 06: Leh - Pangong Lake. After breakfast, leave for Pangong Lake 14,500 ft, through Changla Pass 17,350 ft, IIIrd Highest Motorable road in the world, Arrival at Camp. Later free time at Leisure and enjoy the color changing lake and the sun set on the banks of lake. Overnight Pangong Lake. Day 07: Pangong Lake – Leh. Early morning enjoy the picturesque view of sun rise on lake. After breakfast, drive back to Leh, enroute visit Thikse Monastery and Shey Palace. Overnight in Leh. Day 8: Leh to Delhi Early morning, transfer to Leh airport to board flight back to Delhi. Afternoon at leisure or visit the Red Fort and Humayun Tomb as a part of short Delhi Tour. Day 9: Delhi - Out Morning free at leisure in Delhi and in time transfer to airport to board the flight back to home country.